The book is about a magical journey which starts when Megan and Kevin meet Mr. Cog - a combination cat and dog - who takes them behind the moon. There they discover the wicked Money People who want Megan to stop the moon from turning. Who are these Money People and how did they get behind the moon? Who is Mr. Cog and his other animal friends? Those answers and much more unfold in an enchanting story which reveals universal themes about money, greed, spirituality, animals and treating others as you would have them treat you. It's a mystery with a message! 68 pages. Full color illustrations. 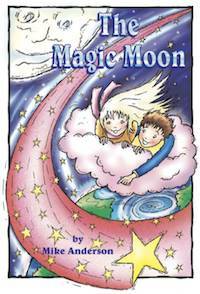 "I wanted to shoot you a quick email to let you know that my 6 year son's favorite book is The Magic Moon. It has been since the first time I read it to him at age 4 - all in one sitting. He constantly asks me to read it." Since 2002, The Rave Diet & Lifestyle site has been owned and operated by Mike Anderson, who is a filmmaker, writer and medical researcher. Its purpose is to advance the cause of natural healing and serve as a gateway of information. Mike is part of a network of doctors, scientists, writers and filmmakers working together to advance the teaching of natural health. Mike has been honored for his work by being nominated for the Right Livelihood Award, better known as the 'alternative' Nobel Prize.